Designed by salon owners who understand not only your needs, but how to make your business run more smoothly and be more successful. Clients, employees, services, products, reports, payroll, gift cards, etc. 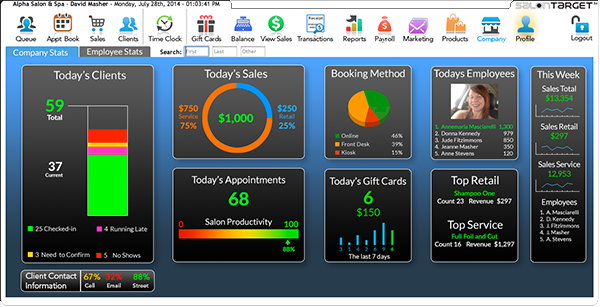 are all dashboard driven and only a click away in SalonTarget® Salon Software. As an owner you decide you who has access to SalonTarget® using Two-Factor Authentication. Limit your employee’s access to specific areas of the software by creating and assigning roles! There is no limit to the number of roles you can create or devices you can authenticate. SalonTarget® has partnered with Bluefin Payment Systems, the leading provider of secure payment technology. We guarantee to match or beat your current credit card processing rate. We also have other options including eGift cards and preauthorizing credit cards before booking. Let SalonTarget® do the marketing for you. Automate notifications and reminders, create targeted email campaigns, boost reviews or run surveys. Empower your employees to sell by linking client preferences to product and service promotions at check out. Quickly glimpse who is coming in, who has arrived, who is in service and who has checked out. See if they booked online, do the have a past due balance or products in their shopping cart. It’s the command center for your business. Booking has never been simpler. All the information you need is a click away. SalonTarget® guides you through booking every appointment efficiently and correctly. Automated cancellation list that notifies clients, customizable service series, standing appointments and confirmation list are all here to make your life easier. 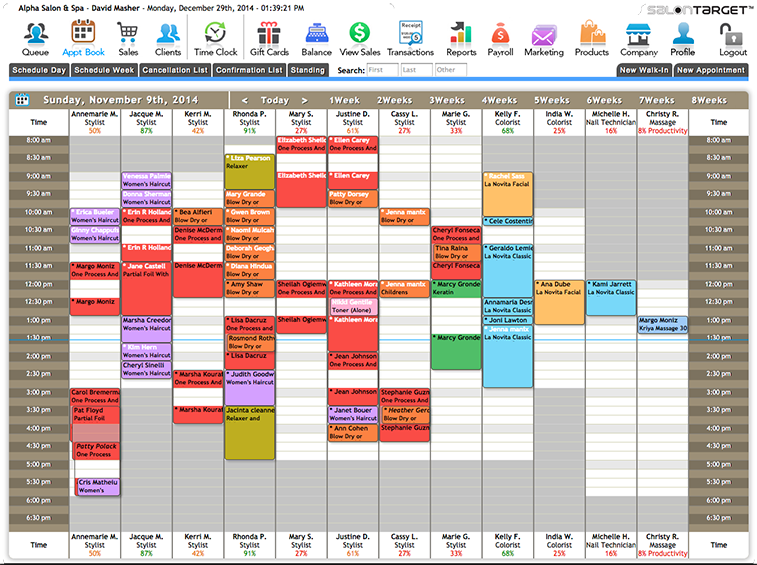 SalonTarget® can even track employee productivity on the schedule. Book multiple appointments, allow over booking or drag and drop appointments are just a few of the many features included. Simple and intuitive, transactions flow from start to finish saving you time yet preventing errors. Services, retail, gift cards and tips, all on one screen and based on your access, edits and voids/refunds are a click away. To make your life simpler SalonTarget® even allows you to update client info and view service history, retail history and future appointments right from the transaction screen. Considerably reduce no-shows! SalonTarget®uses Email, Text and Voice to be sure we confirm your client’s appointment. We also have client Same-day text messaging reminders just in case! You can use our confirmation or our bounced email lists to be sure everyone has been contacted. Set the salon’s preferred contact method or override it with your client’s choice. Whether it is a quick glance at today’s stats (see image at right) or a deep dive into full reports, SalonTarget® has you covered. We love data and we know how to use it to make your business grow. Our report engine is fast and flexible, allowing customization where you need it most! The product dashboard contains product information and it’s purchase history. You can tag related products or product groups, to be recommended to clients with common haircare needs at checkout, online or at the station touch screen. 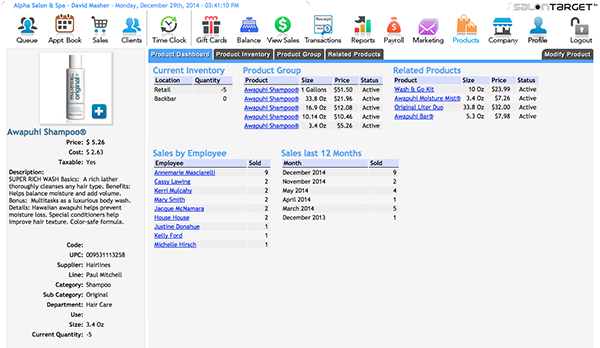 From this page you can also manage the products inventory. SalonTarget® helps you curates manufacturers product to keep your inventory up-to-date. 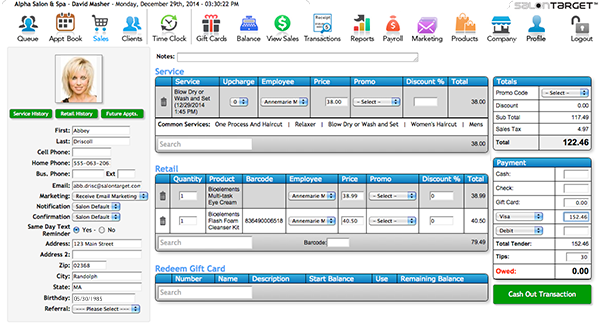 Contact SalonTarget® Salon Software now for a free one on one demo with no obligation. No pressure to buy, read some of our testimonials. SalonTarget® Salon Software Premiere Edition or have a question? Call or email us, we’re always here to help. Hear what our customers are saying about SalonTarget® Salon Software! They range from eight chair salons to chains of 30 salons.